After I gave my outdoor cushion a spray paint makeover two weeks ago I knew I had to give the throw pillows a new look. 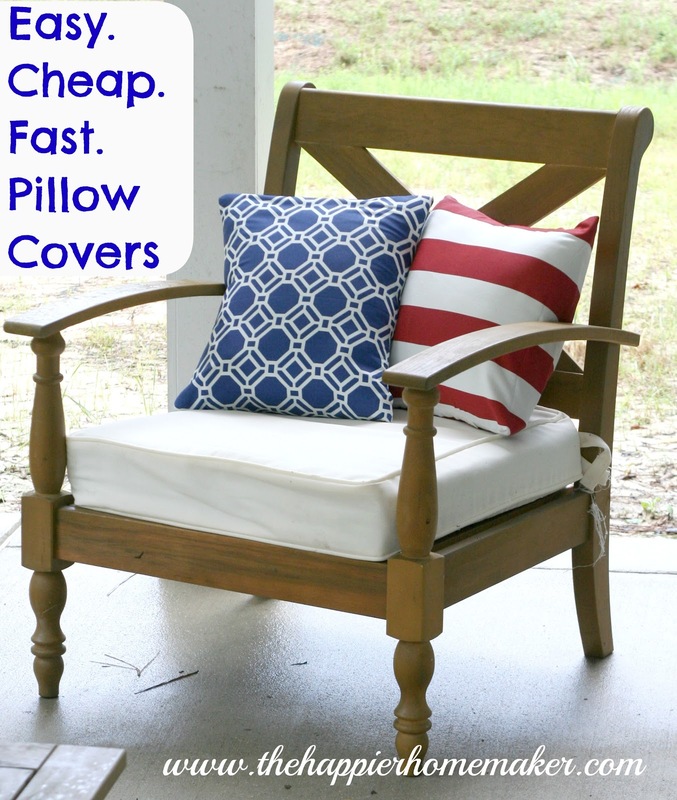 The old look was very pale and beachy-it totally clashed with the navy blue color I painted the stained cushion. 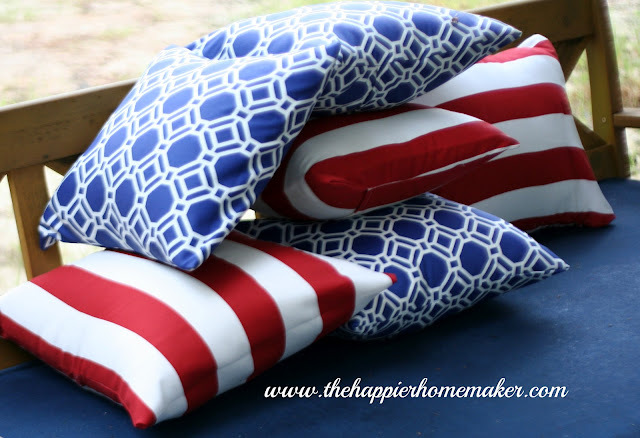 I decided to go with an Americana look and knowing I needed six pillow covers it was going to have to be a DIY job. Any-who, back to the pillow constuction…I wanted my pillow to be very full so I did not allow extra fabric for my seam allowances in the measurements. I hate baggy, saggy pillow covers! I cut my fabric into 16″ by 36″ pieces. This worked out to me managing to get three pillow covers (double sided) from one yard of fabric. On each of the short ends of the fabric iron over a 1/4″ seam and then fold over again another 1/4″ and press with your iron. Sew each of these seams all the way across. 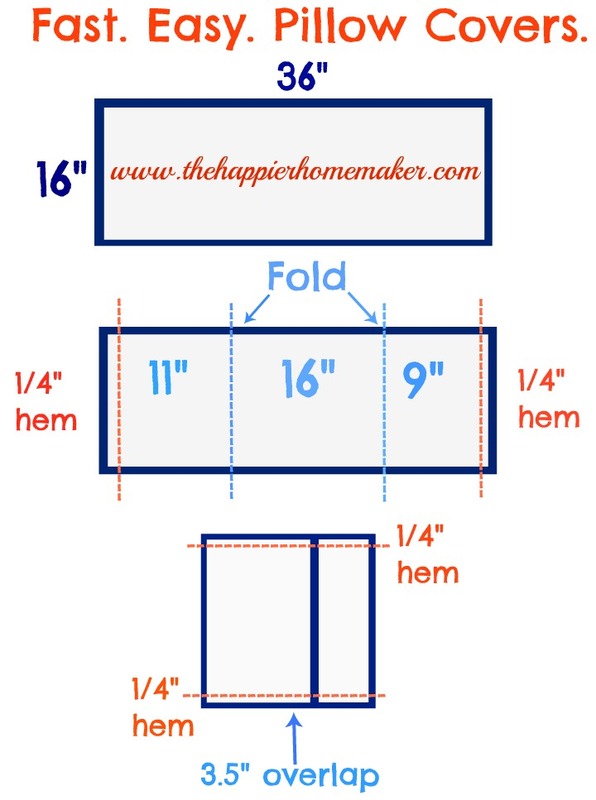 Fold your fabric in 11″ on one side and 9″ on the opposite side so that the hemmed ends overlap about 3.5″. Press the folds and hem 1/4″ in from the fabric edge on the open sides. Flip inside out and you’re finished. Perfect envelope closure pillow covers. I made SIX pillow covers in about an hour for less than $25. I challenge anyone to beat that!! On a side note it was very difficult to get good pictures of the pillows because my backyard is very nearly a disaster zone. They began digging our pool yesterday morning and I had to drag the patio furniture around for a good shot because most of my yard is covered in giant piles of excavated (and weirdly stinky) dirt! Follow me on Facebook or Twitter to see pictures of the process all week!